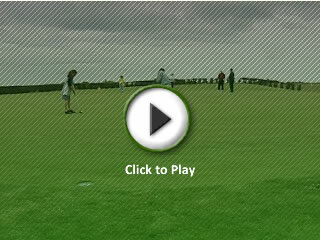 DISK 1 - Rules & Etiquette DVD with 50 video questions and answers. The content is divided into 4 sections which makes navigation quick and easy. The questions do not have to be used in any set order so it is very easy to adapt the content to suit your own particular programs. This is a resource which can be used for junior induction, general new member induction or as part of a club quiz night – use some of the sequences to test some of your more experienced members, see how much they really know! Craig is practicing his chipping and plays a nice shot onto the putting practice area. What has he done wrong? He shouldn't be wearing shorts whilst playing? He stood on the sprinkler when playing his shot? He shouldn't be practicing his chipping here? He only played with one ball? It's a nice sunny evening as Sandy tees off, is there something Finlay and Hamish have overlooked? Their shadow is on Sandy's ball and could put him off? They should be standing in front of him? They should have taken their trolleys on to the tee? They should be reading their course guides to see how long the hole is? Sandy & Finlay both hit excellent tee shots and are quite a way ahead of Hamish. Who is doing what wrong? Hamish should have hit another tee shot to try and get further down the fairway? Hamish should have run on ahead so the other two wouldn't be held up? Finlay & Sandy have gone past Hamish before he plays his shot? Finlay & Sandy should not have hit their balls so far? 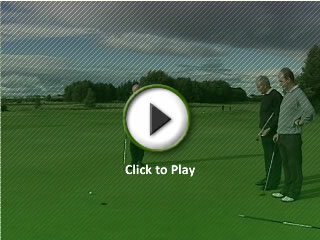 Finlay holes out and they gather to compare scores, What have all players done wrong? 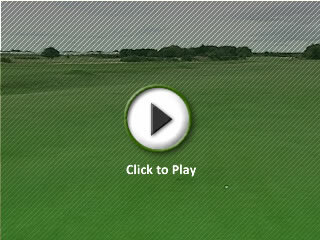 Finlay's partners are standing too close to the hole? They should not be marking their cards on the green? Finlay putted with his glove on? They shouldn't have replaced the flag until they had marked their cards? Contains copies of all the documents supplied in .pdf format which can be printed when required. 5. Order form handouts for the DVD-ROM, these can be customised for you, and handed to new members for them to pre-order from you. 6. View notes and 7. An index of all topics covered. * PDF format - requires Adobe Reader. Download it for free. This has been created specifically for new golfers, whether seniors or juniors, and is a unique reference covering all aspects of the game. It is designed to complement professional instruction and regularly recommends the viewer to consult their pro, for example, for further instruction or advice on equipment. Incorporate the cost of these disks into the fees for your teaching programmes and use it as an advertising tool, i.e. 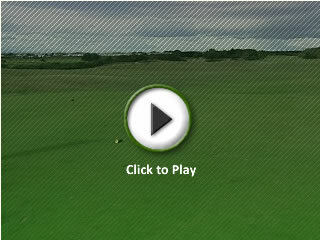 free with tuition the acclaimed Golf Scene Interactive DVD-ROM - worth £15! It covers basic tuition (reminding the user what they have been taught by you) and also provides a great deal of useful information and advice. 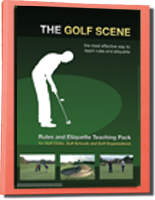 Sections such as Balls in Unusual Places, Golf Language, Competitions, etc., provide a wealth of useful and practical information which will help give your new members the additional knowledge they need to develop their golf skills more quickly and with much more confidence – which will be of benefit to your club. The wealth of information on The Golf Scene DVD-ROM is so important for new golfers that some golf clubs are now considering an increase in subscription to cover the cost of giving away copies with their new members pack. (please contact us for details if this is of interest). The Teaching pack can be purchased either as the basic 3 disk set or complete with an A4 binder containing printouts of all the documents contained on Disk 2. This option obviously saves on preparation time prior to use. If you would like to customise the programme please contact us and we can supply copies of the appropriate documentation in Microsoft Word format.